Porch flooring shall not be made of structural lumber/pressure treated decking. Decking generally has spaces between the planks of wood while tongue and groove floors fit together like a puzzle piece, similar to hardwood floors in your home. Woods such as mahogany, fir, etc. are acceptable. This does not apply to the steps, posts or railings (unless you live in a historic district!). Front porches are not permitted to be fully enclosed. Porches and decks shall not be heated or air conditioned and at least fifty percent (50%) of the exterior wall area shall be open and nonglazed. For all residential structures, porches shall not be located in the required side yard setback area but may be located in the required front or rear yard setback area, provided they do not extend more than eight (8) feet into the front yard setback area. Porches shall not be closer than seventeen (17) feet to the front property line and twenty-two (22) feet to the rear property line. Steps for porches and decks shall not be located closer than six (6) feet from the property line. 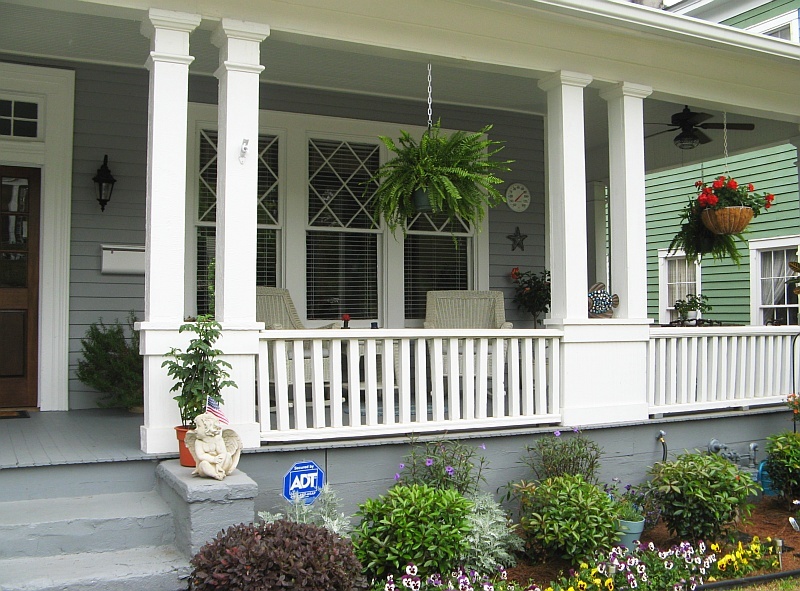 Upper story structures are not permitted over decks/porches if those decks/porches encroach into required yards. For townhouses, apartments and nonresidential uses, decks and porches may not extend into any required yard setback area. Homes in historic districts will need to go before the Historic Preservation Commission. For more information, please contact the Planning Division at 908-753-3391. [ ] A copy of the property survey marking where the porch/steps will go (or will be repaired), how far the porch/steps will be from the side and rear property lines and the size of the porch/steps. [ ] A letter stating that the floor will be tongue and groove and will not consist of pressure treated wood. File the permit for your porch/steps by clicking the button below and printing the zoning application. Submit the application along with your property survey and a business check, money order or cashier's check for $20.00 to the Plainfield Building Division. No cash, cards or personal checks are accepted. Sorry :( . The Zoning Board of Adjustment presides over applications that need variances. If your porch/steps proposal does not meet the above provisions of the Land Use Ordinance, you probably need a variance. The variance process is a longer process than a normal zoning application and requires a board hearing, a 45 day review period by the Planning Division, and a $500 escrow for residential applications and $1,000 for commercial applications, along with fees. To learn more about the Zoning Board process, please contact the Planning Division at (908) 753-3391.